The preschool years – from ages 3 through 5 – are a special time in the lives of young children. During this period, children learn to trust others outside the family. They gain independence and self-control and learn to take initiative and assert themselves in socially acceptable ways. At the same time, they become keen observers of their world and experiment with their surroundings to find out what happens when they interact with other people and their environment. This is an exciting time for language development as well. Our curriculum is specifically tailored to support the unique needs of preschool learners. Social/emotional, cognitive and language development are fostered daily through a carefully planned, center-based environment. Outdoor learning is an integral component of our program year-round. 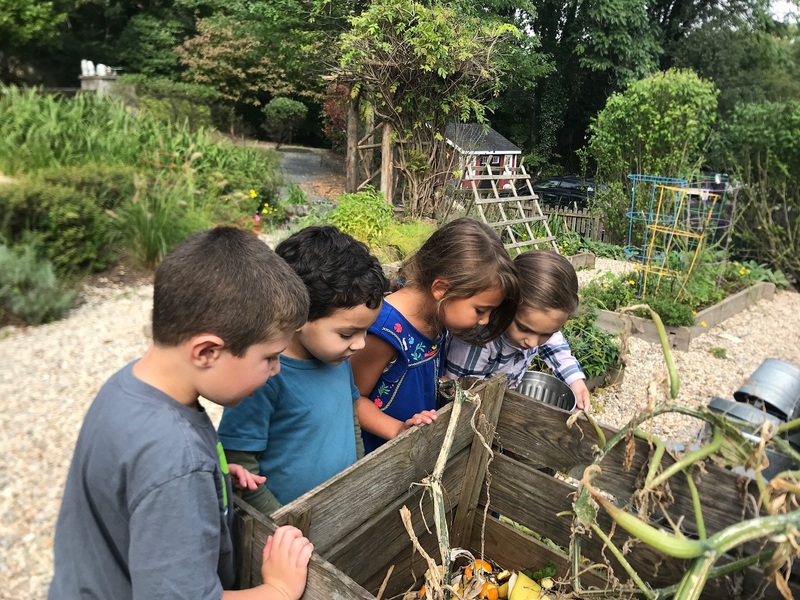 Children have many opportunities to experience inquiry-based learning about topics such as Plant Life and Gardens, Buildings and Structures, Life Cycles and Insects, Long Island Wildlife and Animal Defenses. At Play Groups, we value community connections and strive to provide the children in our care with experiences that will extend their learning beyond the classroom. 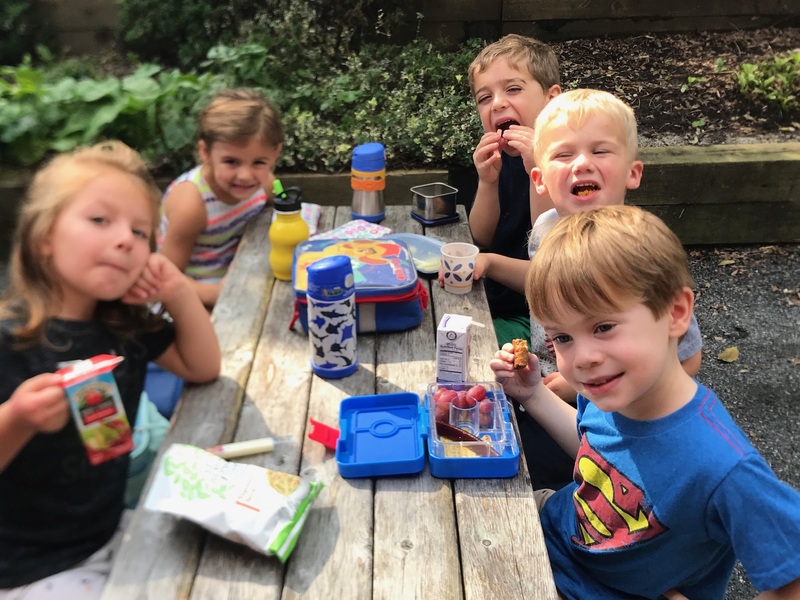 Field trips to nature centers, local farms, museums and other destinations are an important part of the prekindergarten curriculum. The personal interests and experiences of our children and their families are integrated into the program whenever possible. Greet children individually. Help the children store personal items in their cubbies and wash hands. Offer play choices to begin the day. Gather for mini-meeting. Greet classmates. Take attendance. Review day’s schedule, projects and special events. Guide children in selection of learning centers. Observe and interact with individual children to extend play and learning. Observe small-group dynamics, children’s skill levels and interests. Model and assist children in carefully putting away learning center materials in the appropriate bins and areas. Introduce and expand on study topic. Use group songs, musical instruments, rhymes, poems and fingerplays to build math, science, social studies and literacy skills. Introduce and review new vocabulary. Read aloud, discuss and record ideas about study topics. Ensure children wash hands. 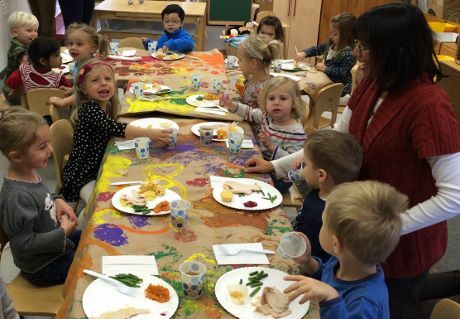 Sit with children and enjoy sharing food and conversation together. Discuss food choices and encourage awareness of healthy foods. Teach children how to open and close snack containers and clean up their place. Guide children in selecting stories or non-fiction literature to read independently and in small groups. Assist children in dressing and packing belongings to go home. Follow line leader to gathering area. Facilitate interest in and exploration of the Outdoor Classroom centers. Observe and extend study topics to outdoor work. Supervise and instruct children in the use of swings, slides and climbing equipment. Support social relationships with teachers and children from other classes. Say good-bye and greet parents and caregivers. Share highlights of child’s day or important information with child’s caregiver.